Before natural orifice translumenal endoscopic surgery (NOTES) can be safely introduced for human use in the United States, several technical and physiologic factors need to be elucidated. Among these are the host systemic and peritoneal responses to inflammation. The inflammatory response to laparoscopy (LAP) has been well characterized, and has been shown to favorably alter immune function when compared to laparotomy. However, the immunologic effects of NOTES are yet to be determined. In addition, the introduction of contaminants via the host oropharynx, combined with an endoscopic gastric closure, may alter host peritoneal flora. We have characterized the effect that NOTES will have on porcine systemic and peritoneal immune function. Twenty-four pigs were divided into three groups: Group A (upper endoscopy-control), Group B (LAP), and Group C (NOTES). Group A underwent general anesthesia with upper endoscopy, Group B transabdominal pneumoperitoneum and closure, and Group C endoscopic gastrotomy, transgastric pneumoperitoneum and endoscopic closure. All animals had blood (systemic) and peritoneal lavage (peritoneal) samples collected for cytokine analysis, drawn preoperatively (time 0), at the termination of the first procedure (60 minutes), and at 48 hours. The endoscopic gastric closure was inspected at 48 hours. 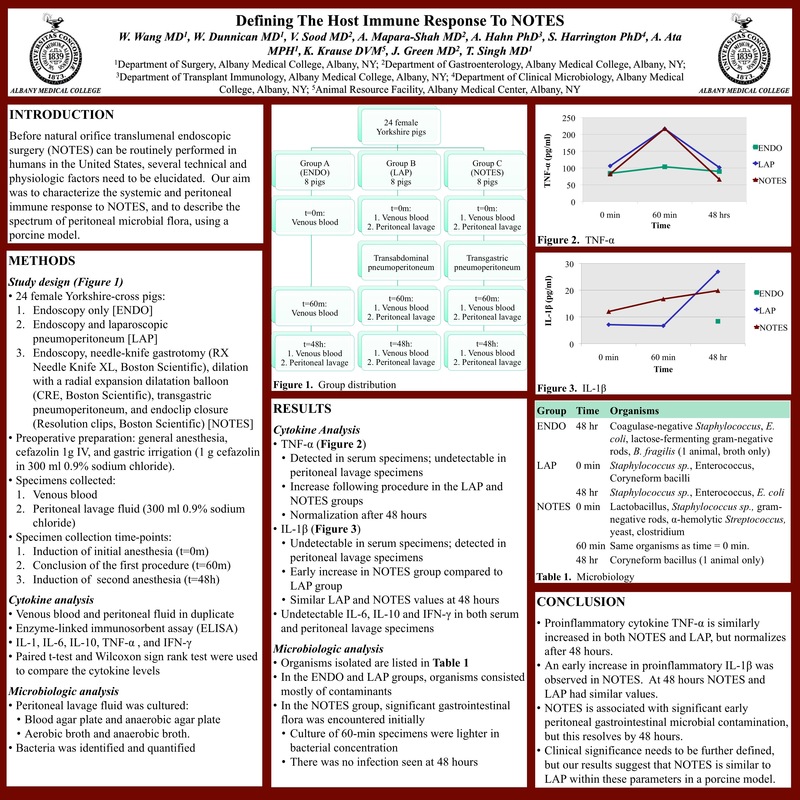 Interleukin-1 (IL-1), interleukin-6 (IL-6), interleukin-10 (IL-10), tumor necrosis factor alpha (TNF alpha), and interferon gamma (IFN gamma) levels were quantified using enzyme linked immunosorbent assay (ELISA). Paired t-test and Wilcoxon signed-rank test were used to compare the cytokine levels at various times after each of the surgical procedures. Peritoneal lavage samples were cultured and identified by group and time of collection.